Having a new member of the family truly excites everyone and when I say everyone this also includes those friends who knew about the arrival. Everybody loves newborn, they are just so cute but really cuddly too. Same thing goes to the zoo keepers at the Cincinnati Zoo and Botanical Gardens, USA. Everyone was delighted after knowing that their male and female hippos, Henry and Bibi, are going to have a baby. This new journey that is soon to be joined with a new baby calf has already made them excited. Who would not get excited upon knowing about this wonderful news? But something in Bibi’s conception period of the baby hippo went different than the usual. This made everyone deeply concerned about the new baby hippo’s life. The tough adventure of Henry and Bibi’s new born baby has left everyone worried. The gestation period of a normal hippo is about 243 days or 8 months. But Bibi went into labor two months earlier than the date she was supposed to give labor to the new baby hippo, everyone got anxious upon this incident. Once a baby hippo is born, it should come contact with the water and should be typically delivered underwater and let them grow up. Growing up for baby hippos means full 16 hours a day all dedicated to swimming. Bibi’s new baby is a premature one and unexpected. The staffs were not prepared for the new baby’s birth which took place in the middle of the night. The new hippo, Fiona, weighed only 29 lbs which is half the weight of a normal baby hippo which is supposed to be between 60 to 110 pounds. Fiona needed some serious intervention when she was born. Her temperature was already starting to drop and her skin got dry which is supposed to be kept wet. The zoo keepers had to work as fast as they could to keep baby Fiona alive. Everyone wanted only the best for baby Fiona and to keep her alive. This made everyone set up a makeshift nursery just for Fiona on its first week. It was never easy and everything done is such a gamble just to save Fiona’s life. They invested so much time and effort for her. 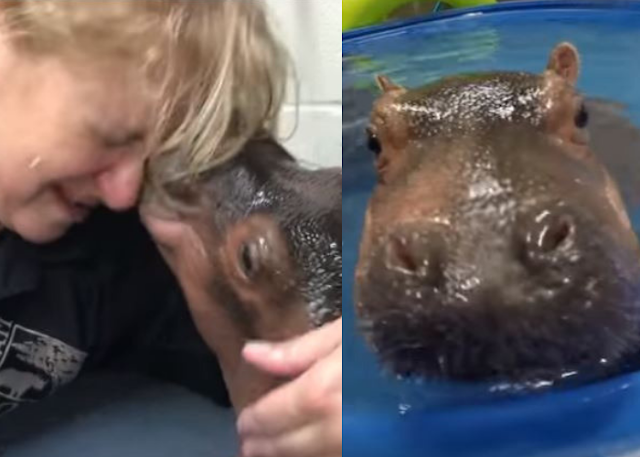 They even came up and create their own intensive care unit with only the same goal, to save the baby hippo Fiona. There were times when they felt like she wouldn’t make it alive whenever the results seem far from what they expected. The crew even had to reach out to a rhino orphanage in Africa just to help them out and give them advice on how to keep Fiona’s skin wet. Taking care of baby Fiona was a rollercoaster ride. There will be times when her health would improve then after some time she would get sick. It was one tough beginning for Fiona and a new adventure for the staff of the zoo. The video below shows how grateful everyone is despite the challenges they have been through. Now, Fiona is happy and healthy and has already celebrated her birthday weighing over 600 lbs. Don’t miss watching the video below and see how she was able to enjoy her life with the help of everyone in the zoo. It was such a heartwarming story.